1830 GENOA GOLD 80 LIRE ITALY. Carlo Felice (Genoa - Anchor mintmark). Reported Mintage: 26,000 only. KM (Krause-Mishler) Catalog: C # 1 08.2. Obverse Design: Portrait of Carlo Felice. Reverse Design: Crowned arms with inscription. Grading Opinion: An beautiful Almost Uncirculated ++ coin. 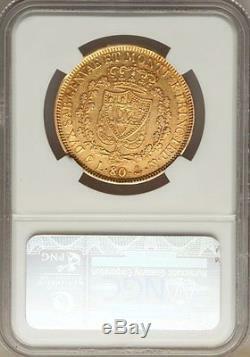 Additional Comments: VERY Scarce solid gold coin. Very low mintage - 26,000 only. Exceptional condition for this early type. Charles Felix I of Sardinia (Carlo Felice Giuseppe Maria, April 6, 1765April 27, 1831) was the Duke of Savoy, Piedmont, Aosta and King of Sardinia from 1821 to 1831. He was the eleventh child and fifth son born to Victor Amadeus III of Sardinia and Maria Antonietta of Spain. His maternal grandparents were Philip V of Spain and Elizabeth of Parma. We are authorized ANA member (#3157070). Israeli citizens must add 1. 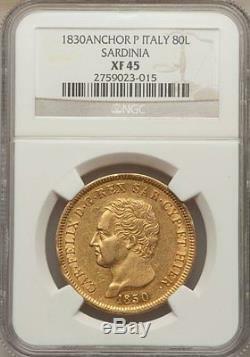 The item "1830 GENOA GOLD 80 LIRE ITALY SARDINIA, SCARCE, NGC XF-45" is in sale since Saturday, July 23, 2016.